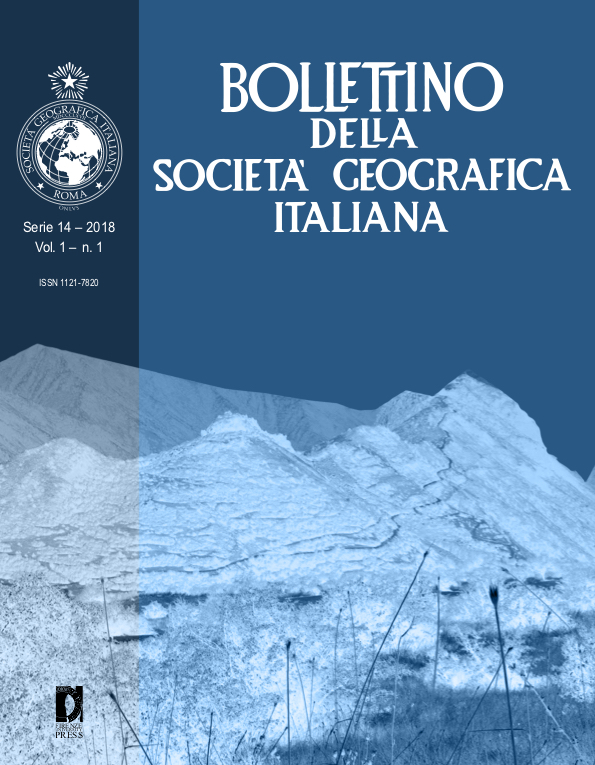 Bollettino della Società Geografica Italiana (BSGI) is the official journal of the Italian Geographical Society. BSGI is an open access peer-reviewed academic international journal focusing on a wide set of geographic topics, contributions to the scholarly debate, news and reviews, from several theoretical and methodological perspectives, on large-scale investigation. Articles are refereed before publication. The Italian Geographical Society is governed by its members, who choose their representatives through direct election. The administration is held by the Directive Council, which includes 15 elected members and includes the President and Vice-Presidents of the Society. Additional members are nominated by public institutions and administrations which are particularly involved in the Society’s activity. The members of the Society who are elected in the administrative offices set the goals of the actions and, in many cases, do participate actively in their implementation. In this work, they are assisted by the Society’s employees and by a wide number of cooperators. The life and actions of the Society are supervised by the President, supported in the general affairs by the Secretary General. The Italian Geographical Society has its home in the 16th century Palazzetto Mattei at Villa Celimontana, (via della Navicella 12, Rome, Italy). In this prestigeous building the Society keeps a rich cultural heritage and organizes its scientific, cultural and educational activities. The Palazzetto hosts exhibits, book presentations, conferences and events related to its institutional vocation. The Library reading room is located on the ground-floor of the building. It is used for regular library service, book presentations and other cultural activities as well. The main public space of Palazzetto Mattei is the “Giuseppe Dalla Vedova” Conference Room (first floor), with a capacity of 100 people. It is fitted with air conditioning, wi-fi and audio-video systems. Events are also broadcasted in streaming on the Internet. Educational activities and courses are held in the “Didactics Room” (second floor). It can host up to 30 students with individual desktop PC, a PC for the instructor, video-projector and audio system. Other teaching supplies are also available in order to facilitate the interaction between the instructor and the students. Other rooms in the building are available for exhibits, events and meetings.